One of the easiest ways to brighten a kitchen is to choose white for your kitchen cabinet color. This classic kitchen look isn’t as dull as it may seem. Modern whites aren’t the same flat white your mother might have used to update her walls. Instead, homeowners today have many different choices of whites that range from cool, blue-tinted, whites all the way through neutrals into warm pink and yellow white tones. Pick a hue and set the tone with your kitchen cabinet color and the palette is set for the rest of the kitchen too. 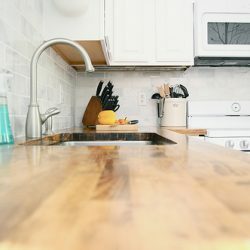 It could be the start of a lovely all-white kitchen remodel that is a cutting-edge, modern, choice popular in big city areas like Queens, Brooklyn, or Manhattan. Even if you don’t want to go all-white for all of your kitchen decor, you can start brightening up the space with white cabinets. However, just changing this one element of your kitchen design can inspire you to change it to the classic kitchen look that is all-white down to the countertops and backsplashes. Choose to reface, replace, or simply paint your cabinets and get the white cabinets color scheme done in as little as a weekend. Here are the pros and cons of each. 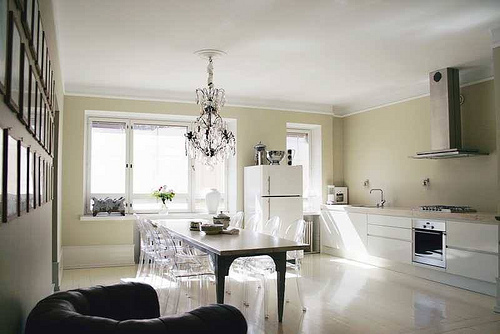 Paint – This is the least expensive option for a white cabinets color scheme. It can allow you a lot of leeway, but you will essentially be keeping your old cabinets. So, if you have storage problems, it won’t address this issue. If you have closed cabinets and you want open ones, you may want to remove some doors completely. Choose paint with a semi-gloss or glossy sheen finish for the outside to make sure your classic kitchen look in white is easy to clean and doesn’t retain fingerprints and smudges. Reface – This is a little less expensive than replacing your cabinets, but can offer many more design choices. You may have to paint the base cabinets, but buy door faces in white to reduce that labor. You can get glass inserts, or new decorative touches, as well as new hardware included. This can totally revamp the look and feel of your white kitchen and even reflect more light with glass inserts. 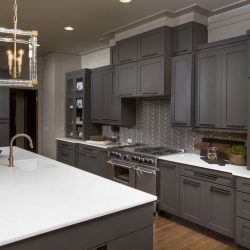 Since there are more design options in this classic kitchen look, it’s easier to see how an entirely white kitchen might turn out with different design choices of paint, hardware, glass, and decorative elements. Replace – This can take longer than refacing or painting your cabinets and is the most expensive option. The benefit is that you can get cabinets that are wider, taller, or even change the entire structural arrangement of the storage cabinets in your kitchen. Plus, you don’t have to paint them when you order them in white. 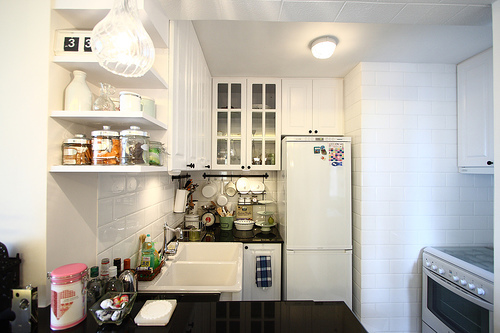 While you are at it, why not add some lighting within or beneath the cabinets? Or, if you want more detailing, get cabinets with engravings or other decorative features. This option lets you do far more than the others and can give you a finish that seems far more professional in the end. However, it does cost the most. 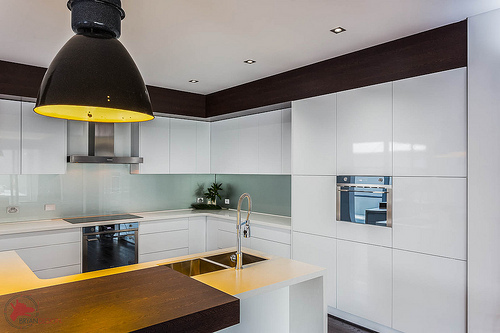 Cool white cabinets color schemes lend themselves well to pairings with steel appliances. Warm white cabinets color schemes do well with gold-trimmed lighting and hardware for the cabinets. There are also neutral tones that could go either way, depending on the splashes of color you choose to use to complement the backdrop of neutral white. Before making a final choice, check out some design magazines or showrooms to see an all-white design scheme.